I love skirts and I love shoes, so why not combine the two? This is just what designer Eva Franco did on the skirt I am wearing today. It features a seemingly endless array of ballet flats stacked on top of one another, which makes for one of the most adorable prints I think I have seen in a long time. Originally, I spotted this print on the Anthropologie website, but it was featured as a dress. The "Well-Heeled" dress from Anthropologie by Eva Franco retails for $350 and while I appreciate that Franco makes all of her garments here in the USA, the price tag for a cotton dress seemed a little steep. On a random Google search for the dress I found the skirt (which I didn't know existed) reduced to about $90 on Amazon. I knew it was shoe/skirt fate and promptly ordered it ASAP. I am glad I did because this is certainly one of my favorite pieces in my wardrobe now and one that I think I'll be wearing for years to come. As I have stated before, blogging has allowed me to discover the world anew in search of the perfect backdrop. While out to lunch, I discovered this back alley with some very cool old buildings. I am not sure what this building is, but I love all of the brick. My bow bag is from Furla, a company that still makes all its products in Italy for prices I find to be quite reasonable. When I went to Rome a while back, it was fun shopping at all of the Furla stores, which offer cute wallets and handbags, mostly in leather. I thought this satin bag was cute and it's a bow, so I couldn't resist. Shoes, bows, skirts...those are definitely some of my weaknesses! Um, I am going to need to have to hunt that skirt down, stat. What a pretty piece! Such a gorgeous outfit, Katie! 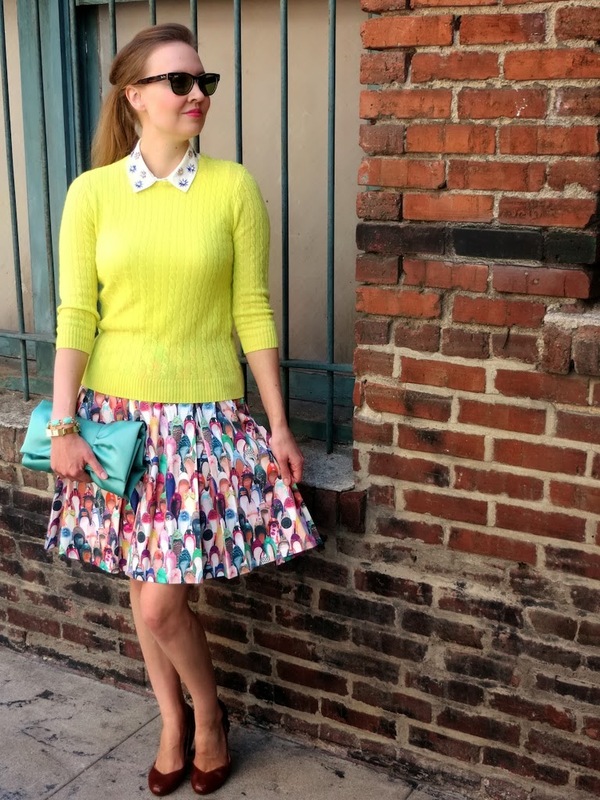 Love the story behind finding the skirt and that Furla is still made in Italy! What a unique print! I love that you constantly come up with such bold pieces. They make amazing outfits.